Welcome back to our blog! If you’ve been keeping up with our blog, you probably have become aware of the number of types of modern locks and keys that many use today and those that have graced history as well. Though many improvements have been made on original key and lock designs, many of our most used locking mechanisms are based on the original designs that are over 200 years old. 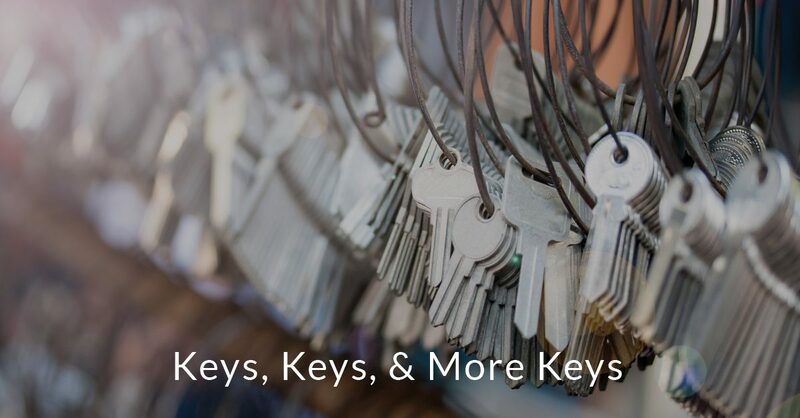 Today, we present an overview of the types of common keys used. Most homes have locks that use a pin-tumbler keys. These keys are flat with serrated edges and grooves along the sides. These grooves and notches allow this key to be used only in its corresponding lock. The proper alignment of the key and the pins allow the lock to unlock and relock. A lever lock key is made up of levers of a variety of heights. Like the pin-tumbler key, once the key is aligned with the proper levers, the lock will turn freely. A common level lock key resembles that of the traditional skeleton key. Lever locks are harder to pick then pin-tumbler locks, but the keys are larger and harder to carry. A tubular key is just like it sounds: it is a tube with ridges of varying sizes along the sides. The tubular part of the key is referred to as the ace, radial, and barrel. Tubular keys are usually used in locks for vending machines, launderettes, bike locks, and laptop security cables. Maison key systems allow for multiple keys to open the same lock, unlike a master key system that can only be opened with one key. Though Maison key systems are useful in apartment complexes and similar settings, some opt not to use this system for its lack of security; those who desire a similar system, but need higher security, will choose another system such as an electronic key system. There are many other types of keys than those listed above. Some keys include magnetic keys, which look like regular keys, but use magnets to work the locking mechanisms inside the lock. There are also double sided keys which look very much like standard car keys. Paracentric keys are designed to open a paracentric lock which utilizes cylinders that are not in a straight line. In addition, there are abloy keys mainly used in Finland, dimple keys, Zeiss keys, and electronic keys. There are a great number of types of keys that are currently used and have been used throughout the history of the world. However, most of the keys and their corresponding locks that are used are one of a few common types. Whether you need your locks replaced, rekeyed, your business outfitted with electronic locks, or you need to replace your transponder keys, our locksmiths can handle it. The locksmiths of Affordable Locksmith serve The Woodlands area with expert and professional service and tools. Contact us day or night and we will respond within 15 minutes of your inquiry. Locked out? We can help with that too. Visit our website to learn more about our service and contact us today!